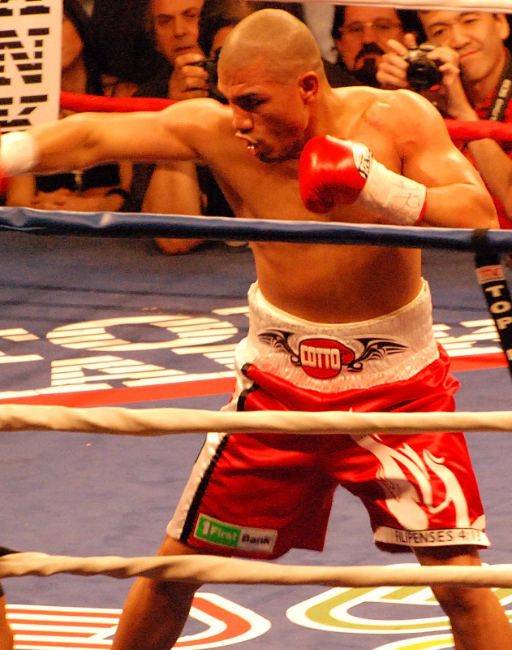 On June 5, Miguel Cotto will challenge Yuri Foreman for his WBA Light Middleweight Title. A titleholder at 140 and 147, Cotto will attempt to join such Puerto Rican standouts as Wilfredo Gomez, Hector Camacho, and Felix Trinidad as fighters to hold titles in three different weight classes. Foreman, making his first defense, looks to add a name to his resume that would give his career a greater sense of credibility. Both fighters look to draw extra inspiration from this bout being held at Yankee Stadium, with Foreman living in Brooklyn and Cotto being a favorite among NYC’s huge Puerto Rican population. Fight fans know Cotto’s credentials. The 29-year old is 34-2 with 27 knockouts. He has wins over championship-caliber opponents such as Cesar Bazan, Lovemore N’dou, Randall Bailey, DeMarcus Corley, Ricardo Torres, Paul Malignaggi, Carlos Quintana, Zab Judah, Shane Mosley, and Joshua Clottey. He is 5’7” with a 67” reach, a little on the small side for a fighter at 154 lbs. Yuri Foreman, the Israeli-Brooklynite, is undefeated at 28-0 with 8 knockouts. The 29-year old is considerably longer than Cotto at 5’11” with a 72” reach, but he has deficits in world-level experience. Before beating the capable but inconsistent Daniel Santos in November for his belt, he never faced anyone overly formidable. At the same time, he does hold wins over some pretty good fighters such as Jesus Soto-Karass, Anthony Thompson, Andrey Tsurkan, and Saul Roman. Even Cotto apologists would probably admit their man is not the force of old. Exactly how over the hill he is remains open for debate. While he wasn’t overly competitive against Pacquiao, he didn’t embarrass himself either and even managed to somewhat batter the Filipino dynamo, who was marked about the face and incurred a damaged ear in the fight. Cotto showed that he might not be able to compete anymore with the absolute elite, but that he’s probably still got something for some of these young upstarts. When you look at the long run of tough guys that Cotto has fought, it’s impossible for him to not have some serious mileage on his odometer. It’s nothing against him. I think I speak for all boxing fans in saying he’s been a pleasure to watch—a real fighter who took on everyone. It’s peculiar that Foreman, perceived as the newcomer, is actually a few months older than Cotto. He is a swift boxer, who features movement and nifty maneuvers to usually outpoint his opponents. Foreman fights with a lot of character and moxie. With a good amateur pedigree and a lack of taxing wars, he is an experienced but well-preserved fighter who is definitely in his prime. With only 8 knockouts in 29 fights, he isn’t much of a banger, even though he was earning Daniel Santos’ respect with some power shots during his title-winning effort last year. He is also nowhere near as battle-tempered as Cotto. Is Cotto simply a spent force? Is his experience, supposedly one of his bigger advantages over Foreman, actually a disadvantage in that it has resulted in enough wear to give the likes of Yuri a good chance in this fight? Is it possible that Cotto is simply too good for Foreman? 20 years from now when looking back, Cotto will certainly be regarded as the better fighter between the two. Has Cotto’s demise been overstated? Is Foreman truly ready for such a high-profile fight? He’s been operating almost invisibly during his whole career. Have a bunch of low-key bouts prepared him for a fight of this nature? Will he have any offense to dissuade Cotto? It’s one thing to have your way with the erratic Daniel Santos, but isn’t it quite another thing to beat Cotto, whose back is against the wall with his career on the line? Cotto is in a difficult fight here, but not nearly as tough as what he is used to. I think there’s a chance that the fresher Foreman might be a little too quick and big for this version of Cotto, but I’m going to go out on a limb and predict that Cotto has at least one more big night in him. I don’t think speed bothers Cotto as much as power. Cotto had a pretty easy time with Paulie Malignaggi, though the conditions for that fight were different. I almost expect a lesser version of that fight. I think Foreman will find Cotto’s aggression, power, bodywork, and overall class to be a package unlike anything he has ever seen in the ring before. I think Cotto has dipped enough to allow Foreman to have moments of effectiveness. I just see Cotto being effective on a more consistent basis. In a competitive fight, I see Cotto taking about 8 rounds and winning a unanimous decision.